We recently got a feature on t-shirt island , a big thanks to them for shedding some spotlight on us. We are also going to be releasing some new designs real soon!! 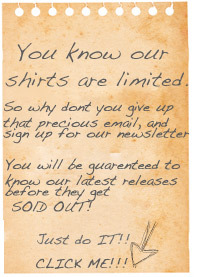 So keep checking back, and DON’T forget to sign up for the newsletter, so you can get the latest news! !